The future of pinball is bright! 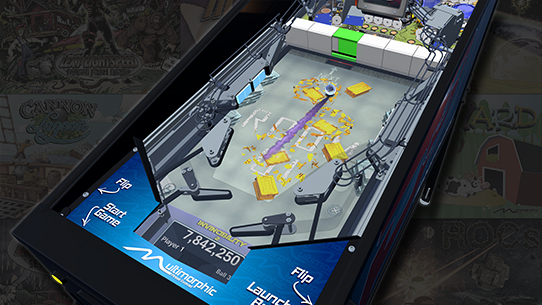 Multimorphic is delivering both traditional and progressive pinball games on its revolutionary physical pinball platform, the P3. This is real pinball (steel pinballs, physical flippers, and actual targets), enhanced with new technology and capable of delivering years of entertainment. If you enjoy pinball, the P3 is for you! With a varied and ever-growing game library, the P3 delivers limitless fun to people of all ages, interests, and skill levels. Games with complex shots layouts and deep rulesets, straightforward layouts and self-explanatory objectives, and everything in-between provide something for everybody to enjoy in a single machine. 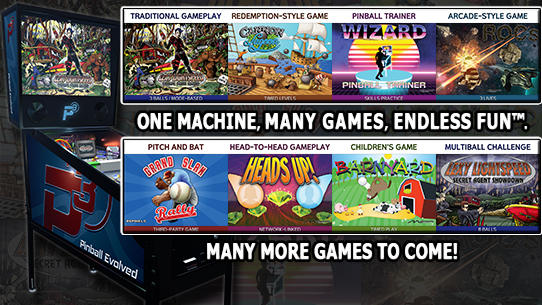 A 1080p high definition video display and state of the art ball tracking technology on the lower part of the playfield combine to enhance the traditional pinball experience. The artwork reacts in real-time to your progress in each game, and the physical pinball interacts with virtual objects on the screen before interacting with physical objects on the upper portion of the playfield. Swappable upper playfield modules make it easy to enjoy a variety of physical game features and themes. Swaps take 60 seconds or less, and the game kits help you grow your game library for a fraction of the cost of buying traditional pinball machines. The future of pinball has arrived!